In the summer of 2005, I spent a week in the Belgian Ardennes with seven friends. We stayed at this holiday home, Maison La Balade in the village of Noiseux. Maison Ma Balade in Noiseux. A decorative statuette in Maison Ma Balade. The tv belonged to the holiday home; the purple crocodile was ours. Some board and card games to keep us entertained. Food was important on this trip. Here's some mozzarella. A pan full of pistachios. Rum, tequila, whisky and more. One of our favorites: Settlers of Catan. 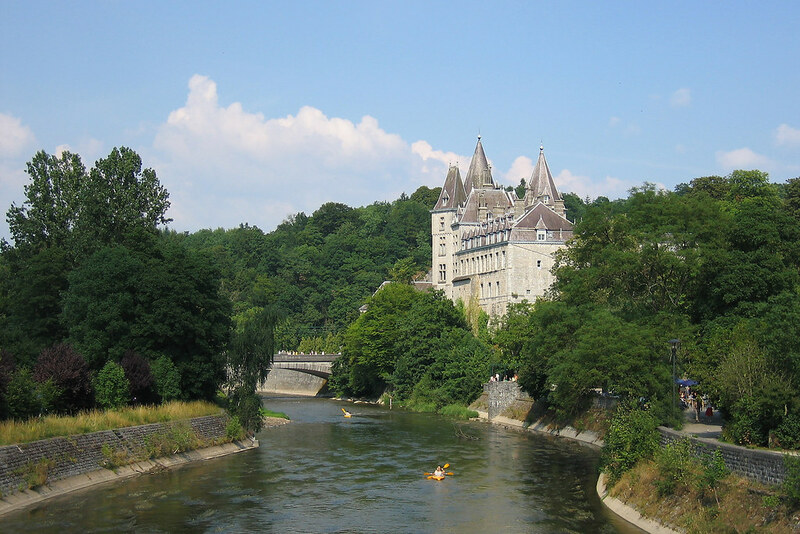 Day trip to the city of Durbuy with the eponymous castle on the banks of the Ourthe River. The Homalius Rock or the Roche à la Falize in Durbuy. In geological lingo, this is known as an anticline. We only walked past it this time, but on a family trip five years earlier, I climbed to the top and rapelled back down. The Ourthe and Durbuy Castle. Panoramic view of the hilly Ardennes landscape outside Durbuy. A mushroom with a garlic clove. Some citronella candles to keep the bugs away. Long-exposure shot of the grill. Day trip to the city of La Roche-en-Ardenne, featuring the Saint Nicholas Church (Église Saint-Nicolas). The ruins of La Roche-en-Ardenne's medieval castle. View from a castle tower. An overgrown miniature golf course outside the castle. An owl in the castle's falconry. A hawk or eagle in the castle's falconry. Another hawk or eagle in the castle's falconry. A vulture in the catle's falconry. Preparing some French for breakfast.